(a) Using Linux perf utility. I will discuss the perf utility briefly in this entry. There are two parts to perf utility usage: perf record to sample the function calls executed by a process or processes. perf record command writes the output to a file perf.data, by default, in the current directory. perf report reads the perf.data file and prints a human readable output of top function calls. Think of the functionality of the perf report command as “group by function_call, order by count desc” operation. You can use perf utility to watch the server, a process, or a subset of processes. In this example, I recreated the issue in my database session and so we will use the command: perf record -p to record the function call samples on the dedicated server process associated with my session. -- Login to the database using your favorite tool. -- Recreate the issue in the first window. -- Control+c the perf record command also. From the output of perf report command, you can infer that the process was seen executing the BZ2_decompress function calls in ~35% of samples. That BZ2_decompress function call is executed to decompress the segments, compressed with HCC archive compression. Next function call in the list(25% of samples) unRLE_obuf_to_output_FAST is also associated with bzip2 decompression function (Refer unRLE_obuf_to_output_FAST ). We were able to identify the function calls consuming the CPU cycles quickly using perf tool. In this case, it is HCC archive high decompression. So, we can correlate this data with the SQL Monitor output, identify the line number spending time, and understand the reasoning behind high CPU usage (and high elapsed time). I am excited to announce that I will be participating in OTN sponsored Oracle ACE Director’s tour in India (April 23rd to May 2nd 2016), and presenting ( with deep dive demos ) about RAC, performance, and in-memory. This is a golden opportunity for you to learn some of the internal stuff that I talk about in my class too. Refer http://otnyathra.com for further details. I am also excited to be in the tour with Connor McDonald, Biju Thomas, Sai, and many others. Don’t forget to send an email to Sai, the conference rooms will fill out quickly. I am an ardent believer of “show me how it works” principle and usually, I have demos in my presentation. So, I was presenting “Tools for advanced debugging in Solaris and Linux” with demos in IOUG Collaborate 2015 in Las Vegas on April 13 and my souped-up laptop (with 32G of memory, SSD drives, and an high end video processor etc ) was not responding when I tried to access folder to open my presentation files. Sometimes, demos do fail. At least, I managed to complete the demos with zero slides 🙂 Apologies to the audience for my R-rated rants about laptop issues. You can download presentations files from the links below. In my earlier post, I talked about, how tableau can be used to visualize the data. In some cases, I find it useful to query AWR base tables directly using Python and graph it using matplotlib package quickly. Since python is preinstalled in almost all computers, I think, this method will be useful for almost everyone. Of course, you may not have all necessary packages installed in your computer, you can install the packages using install python packages . Of course, if you improve the script, please send it to me, I will share it in this blog entry. 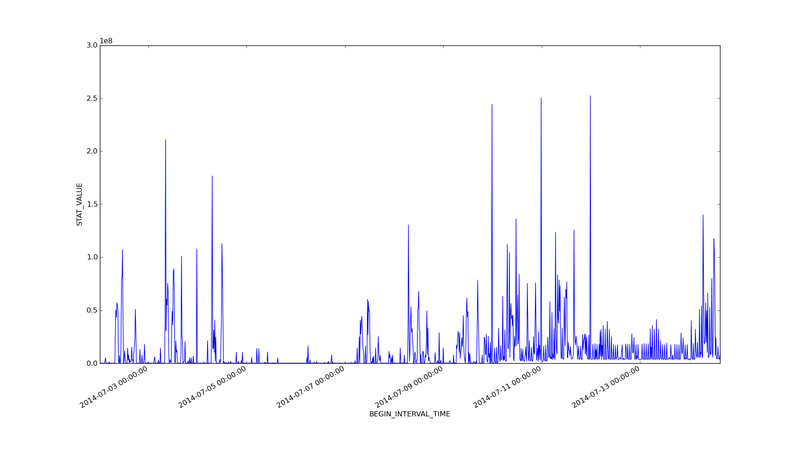 # To graph the events for the past 60 days, for inst_id=1, connecting to PROD, with username system.